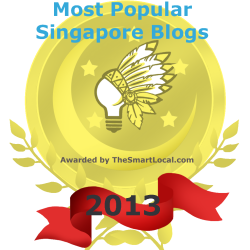 Prime Minister Lee Hsien Loong had said at the National Day Rally 2013 that, “every school is a good school”. Indeed, is every school a good school, as PM Lee claims? Let me show you some statistics that will shock you. According to the MOE, primary schools which offer the GEP are “provided with additional teachers” and “an annual programme grant of $53 per pupil“. Already, you can see that things are equal. And eventually, of the students who then enter university, “from AY2007-2009, over 70% of the applicants to the National University of Singapore’s Yong Loo Lin School of Medicine (YLL SoM) obtained 4As or better in the GCE ‘A’-level examinations.” They are more likely to come from the elite schools as well. So, you see, the elite pathway will give the students an almost exclusive route to enter the local public universities. But what about students who do not enter elite schools? 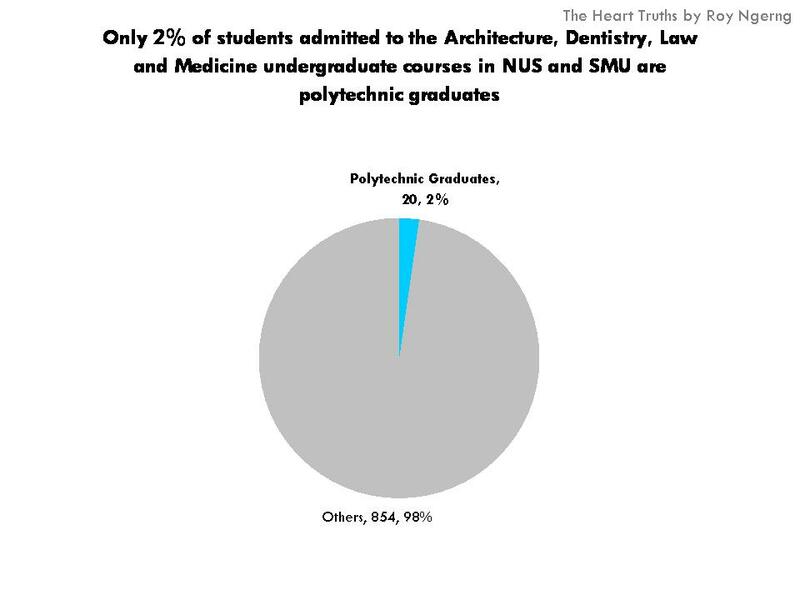 If you look at the admissions of polytechnic graduates to university, “over the past ten years, about 200 local polytechnic graduates have been admitted to the Architecture, Dentistry, Law and Medicine undergraduate courses in NUS and SMU,” or an average of 20 students every year. In 2012/2013, there were 741 students who were admitted into these courses at the NUS and around 133 students who were admitted into SMU – a total of 874 students. So, of the total enrollment of 874 students, polytechnic graduates makes up only 2% of the total enrollment (Chart 2)! Not only that, when we look at the admission of local polytechnic graduates to law courses at NUS and SMU from 2007 to 2012, there was only an average of less than 2 students from the polytechnics admitted every year (Chart 3)! 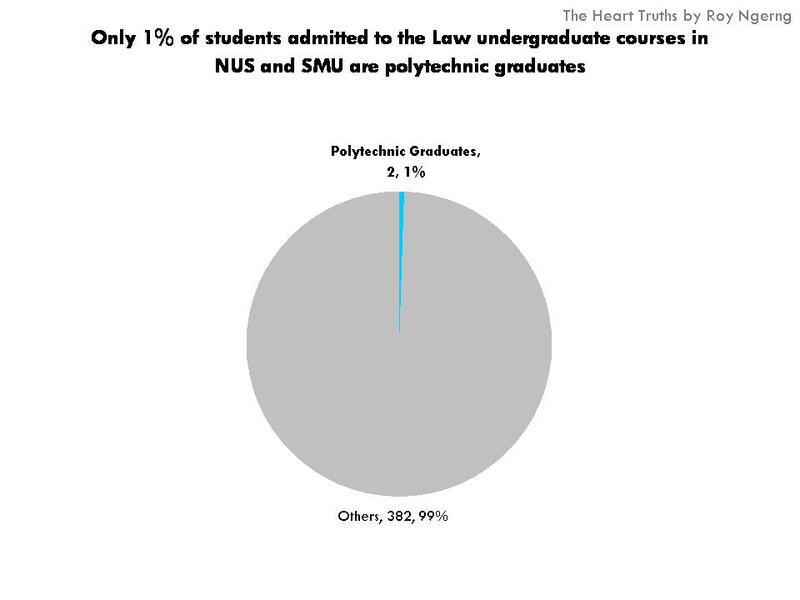 The law courses at NUS and SMU admitted 384 students last year, which means that polytechnic admissions only accounted for less than 1% of the total admissions (Chart 4)! Shocking, isn’t it? The chances of a polytechnic student entering these courses in next to zero, literally! Things become clearer when you look at household sizes. 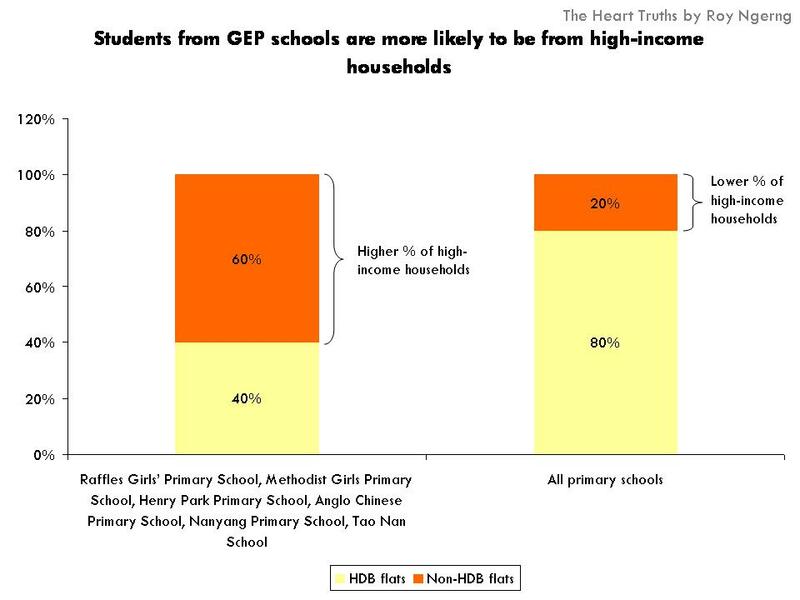 If you look at the students who had attended Raffles Girls’ Primary School, Methodist Girls Primary School, Henry Park Primary School, Anglo Chinese Primary School, Nanyang Primary School and Tao Nan School – schools which offer GEP, only 40% of these students live in HDB flats, as compared to the “80% of all primary school students reside in HDB flats” (Chart 5). Thus students from elite schools come from more well-to-do families. Also, “among the Secondary 1 students who enrolled in Integrated Programme (IP) schools in 2009, more than half live in HDB flats.” This is similar to in 2002, where, “about 50% of Singaporean students in Independent Schools live in HDB flats in 2002. (Chart 6)” Again, students from elite schools are more likely to come from high-income households. 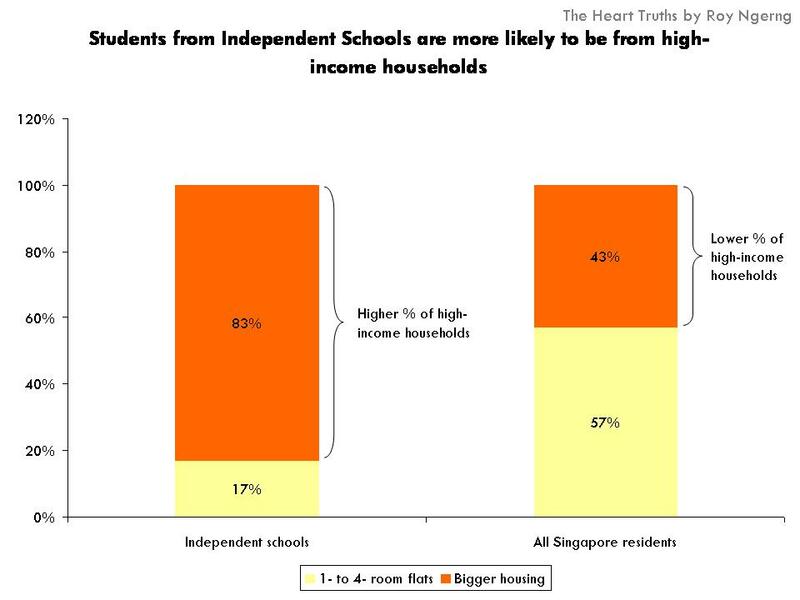 Also, “about 17% (of students from Independent Schools) live in 4-room HDB flats or smaller.” However, among the general population, there is a higher proportion of low-income households, where 56.5% of Singapore residents living in 1- to 4-room flats. Yet, only 17% of the students in the Independent Schools live in 1- to 4-room flats (Chart 7). 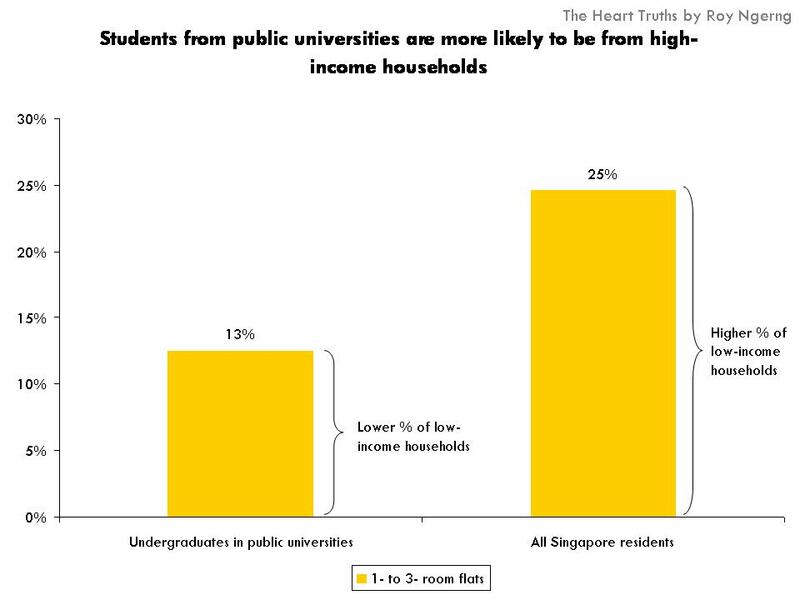 Finally, of the students who enter the public universities, only “one in eight undergraduates … come from households who live in 1- to 3-room flats“ – which is about 12.5% (Chart 8). However, there are 24.6% of Singapore residents who live in 1- to 3-room flats. Shouldn’t there be more students from the smaller housing types, and from the lower-income group who should be attending university, but are not able to? 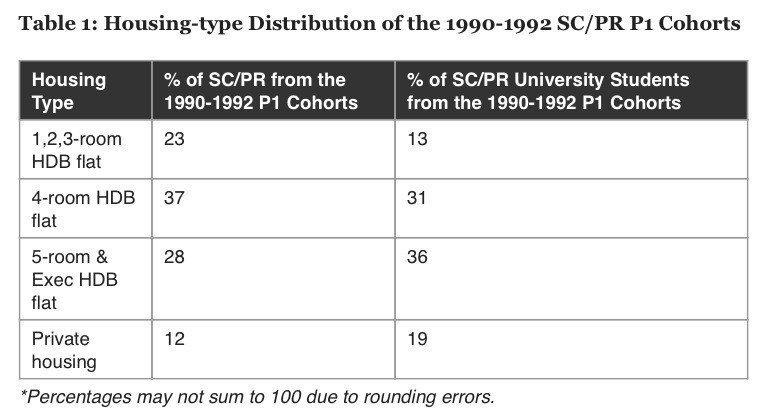 Take a look at the table below to see the students from primary schools in 1990-1992 who eventually made it to university in 2007. Of those who had entered Primary One in 1990-1992, only 40% come from higher-income households and live in 5-room & exec HDB flats, or private housing. But of the same cohort who entered university in 2007, this rose to 55%. On the other hand, there were 23% of students in Primary One who live in lower-income households of 1, 2, 3-room HDB flats. But a much lower 13% of the low-income households were able to enter university (Chart 10). So, PM Lee might say that, “every school is a good school”. Then, what happened? Why is the reality so different? Perhaps Vice-Principal Pushparani Nadarajah had hit the nail on the head – do “our leaders and top officers” even dare to put “their children in ordinary schools near their home”? Does Lee Hsien Loong even buy his own rhetoric that “every school is a good school”? Do you know that the PAP government spends the least on education (as a % of GDP), as compared to the high income countries (Chart 11). 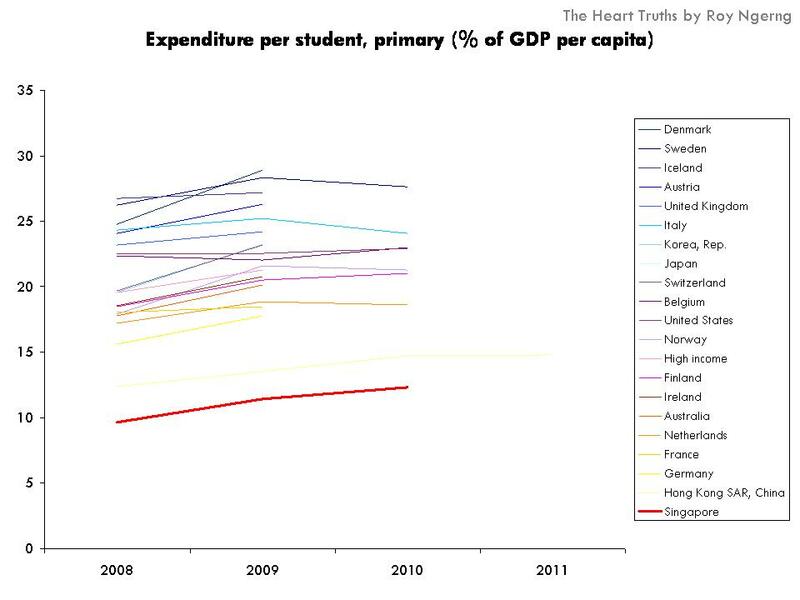 We also spend the lowest on primary education (Chart 12). 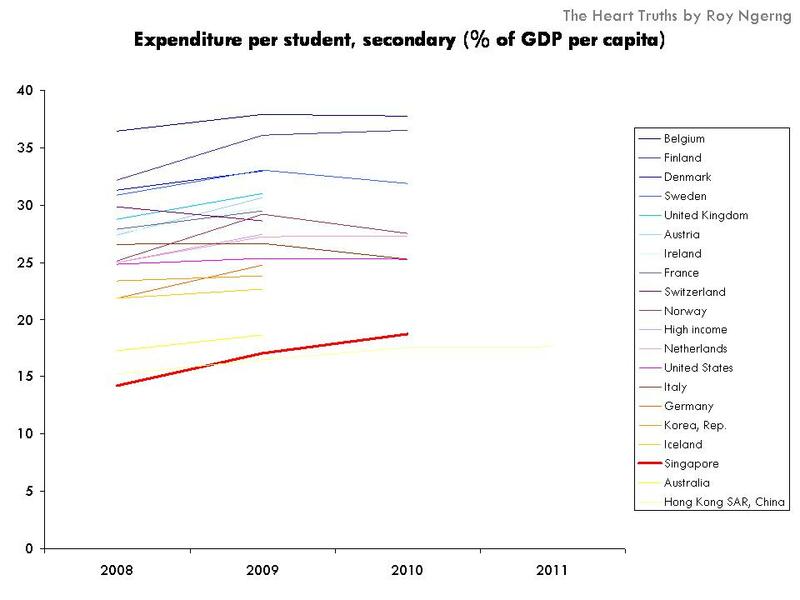 And we also spend the lowest on secondary education (Chart 13). 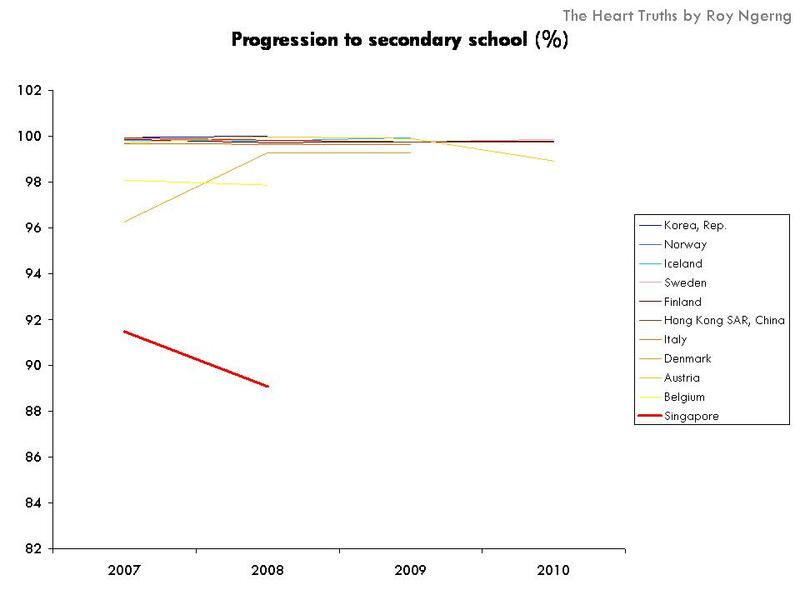 And thus our students have the lowest progression into secondary education (Chart 14). What’s happening to the Singapore education system? Why are things so unequal? Why do some students get ahead while other students are prevented from getting ahead? PM Lee might say that, “we value every child and that we want to give every person the best possible chance to start off well in life,” and that, “I believe we can make every school a good school and we have done a lot of that to ensure that every school provides a good education for the students. We give them the resources, we give them the good teachers, we emphasise values and we have made a lot of progress towards this goal.” But is each school really treated equally? But what is he talking about when the statistics show clearly that there is a “closed-self-perpetuating elite”? The system in Singapore has become very unequal. We are beginning to see the cracks in a system which has become so divisive and unequal that some Singaporeans are falling through the cracks. Education is the cornerstone to any society that can advance and progress. And I am afraid that the PAP government might not be doing enough to prevent these cracks from opening, and to prevent Singaporeans from falling through these cracks. It is very, very unfortunate. 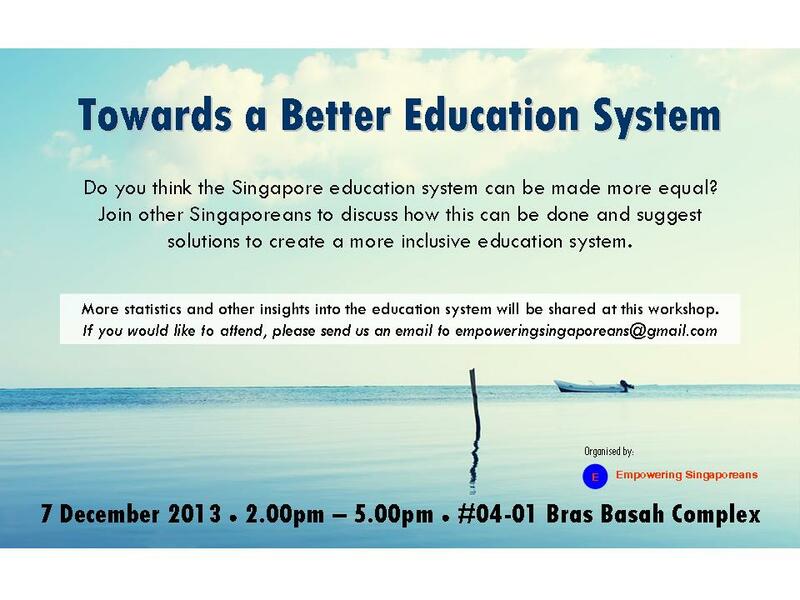 If you are inspired to want to discuss more about how we can change the education system in Singapore, you can join other Singaporeans at this upcoming workshop to design solutions to make the education system more equal in Singapore. For more information, you can visit the Facebook event page here. “The fiercest criticism came from Nick Clegg, the deputy prime minister, who attacked the senior Tory’s “unpleasant, careless elitism” and accused him of talking about people as if they were dogs. “I don’t agree with Boris Johnson on this. Much as he is a funny and engaging guy, I have to say these comments reveal a fairly unpleasant, careless elitism that somehow suggests we should give up on a whole swath of fellow citizens,” Clegg told LBC 97.3 radio. Clegg said he believed children developed at different paces and should have access to a culture of opportunity, aspiration and hard work. His remarks were echoed by David Lammy, the Tottenham MP who is considering a bid to run as mayor of London for Labour in 2016, who said the remarks were worse than careless. “I don’t think that’s just careless. I think it’s an insult,” he told BBC Radio 4’s World at One. “It’s an insult to cleaners in London, to people who are home carers in London, people who are minimum wage, giving them the suggestion that they are sort of bottom of the cornflake packet. That’s not the sort of society I thought we wanted to live in, particularly when the mayor has supported the London living wage, which is about saying we all ought to be in this together. Now looking back at the headline “PM Lee: Every School Is A Good School? Really?”, I see numbers and statistics being used to try to build a narrative about what your thoughts are. But the key point you’re missing is – what is a “good” school? What is not a “good” school? Without defining this there is no argument. I definitely don’t agree with PM Lee that every school is a good school, but I think your logic misses the mark too. Its not just about the schools but more about the family background. Why rich people kids go to good schools and enter public university is because they have high expectations of their children. A rich person who’s successful will want his children to score As while parents from poor families just want their kids to get pass or Bs. There are poor families children being sent to good school but they end up failing exams. Thus its not about the school but about the parent’s expectations also. I believe you are aspiring to be a politician and it’s amazing to see you have gathered so much statistics to support your case and discount our education system. If your energy can be directed towards constructive criticisms and propose realistic improvements then perhaps you can garner a vote from me. Every system has its merits and flaws and your blog does not address how we can improve schools better. 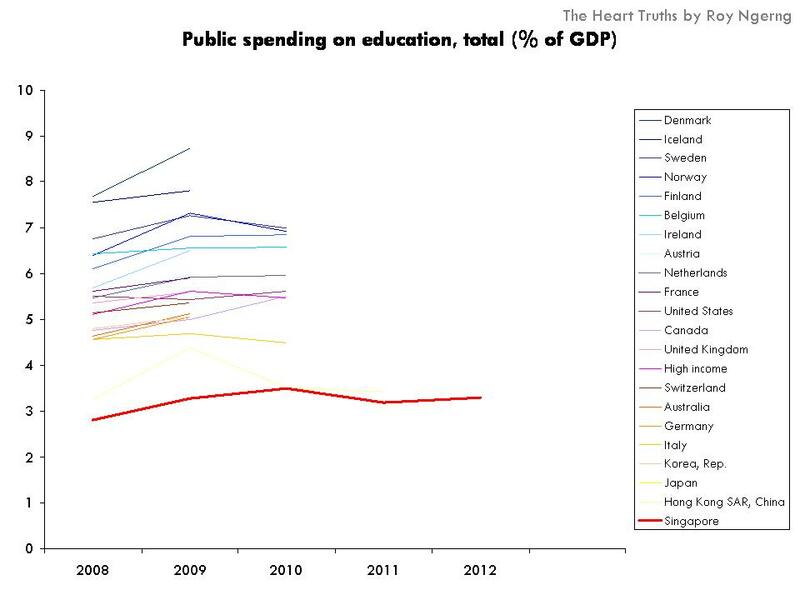 To say that our government is spending very little on education is flawed. Are you suggesting spending more on an expensive branded bag is not as good a investing in a similar quality bag that is half the price? I will rather think that our education has achieved significant success at low costs, building and shaping individuals to be productive citizens. This is perhaps due to our thrifty Asian values, I.e. delivering a good product at a much lower cost. And as a result of our ability to watch our expenses, S&P reaffirms ‘AAA’ long term credit rating of Singapore. Do you know what that means? It means we are attractive to MNCs and wealthy individuals that can invest and create jobs for us. Do you realise how much we have advanced as a nation since the 60s? To all those clamouring for your CPF money to be returned to you and to those who feel the education system has failed you, you can always renounced citizenship, take your money to leave your friends, buddies and families behind. We forge ahead as a nation with suggestions and not as a myopic group just bent on swaying the emotions of our fellow compatriots to tear down a social and economic structure that is in awe by not only our neighbours but globally as well. The key is that do schools have the resources to ensure people do not lose out significantly to the rich and powerful. My take is school do have such resources. I was never in an elite school, studied a neighborhood JC and Secondary school, never had tuition in my life. I manage to advance to University and about to graduate with a First Class Honors. The resources is always there if you are willing to look for it or willing to ask your teacher / prof. The problem is many students do not how to utilize such resources and complain they lose out to people who have tuition. your article has failed to consider the crucial function of schools — value adding. I believe that this is what should be discussed rather than merely citing statistics on how many students from ‘elite’ institutions end up in desirable courses in college. schools are made up of their students. the students who go to ‘elite’ institutions are generally more inclined to studying (and consequently easily make the bar for desirable college courses) while students at other institutions have other aspirations. for example, students at the sports school have a passion for a certain sport. it is therefore not surprising that many students from ‘elite’ institutions end up taking desirable courses in college. what should concern us is the prevalence (or lack thereof) of students who want to improve but find it difficult to do so because of certain limitations in their school. should there be statistics to show that this group of students are of a significant number, there i believe there is great cause to worry about the sustainability of our current education system. i can’t deny tha the facts are true, but I must say that everyone have an equal chance of getting into the schools they want, no matter what primary school they are from, or their family backgrounds. My family lives in a 3 room flat and i come from a neighbourhood primary school as well. However, I was able to make it to the so called top school and eventually to jc. I feel that what really pushed me to work hard and be confident that I am able to get into any school i want was my parents, who encouraged me and supported me through. There was a period of time, when I thought that students from top schools are rich and snobbish. However, I was proved to be wrong. It may be true that most of my friends come from rich families, they do not show it or look down on people like me. Also, many of my classmates come from neighbourhood primary schools, have parents of only primary or secondary school graduates, but they are still able to make it to their dream school with their hard work and determination. Now a days, after perusing your articles, I like to read the comments and try to count the number of people from the PAPs “internet brigade”. You know, those low IQ Singaporeans that the PAP use in their war chest to either deny the facts, or embark on a personal attack on you. In fact, they will attack anyone who agrees with your research. But we all know that the more accurate your articles, the more such people will rear their ugly heads in these forums. You have a following and it is getting bigger. I am confident that this will translate into more anti-PAP votes. Useful suggestions ! Just to add my thoughts , if your business was looking for a a form , my business partner filled out a template version here https://goo.gl/E7bc3v. Reblogged this on Travel and leisure. Plus some rants. interesting post. i like the post. 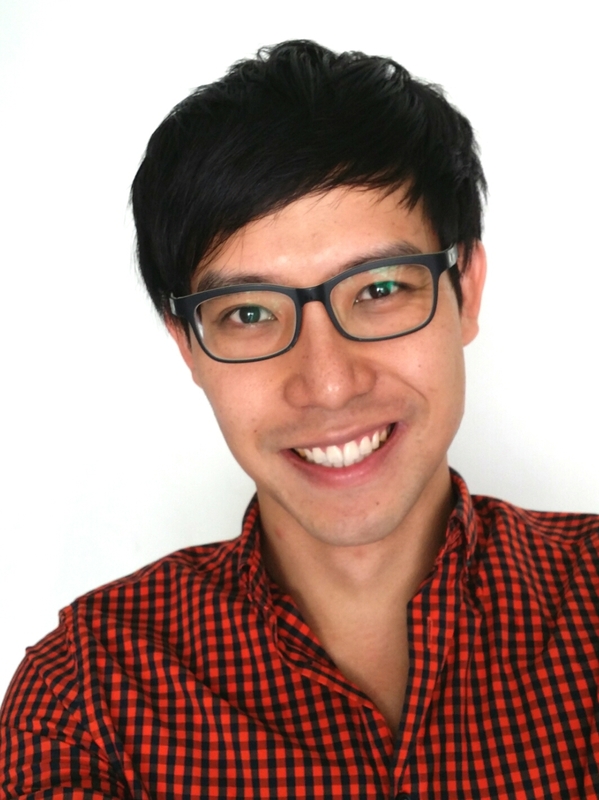 How Is Singapore’s Education System Unequal?